I am going to make a prediction about the upcoming election. I predict that either Barack Obama or Mitt Romney will win. I admit that that is not much of an prediction, but given that they are the only two candidates, one of them has to get the majority of electoral votes and win. There are, to be sure, third party candidates, but it is exceedingly unlikely that any of them will get even one vote. That is the way it has been in almost every American presidential election. Even in those few cases with a significant third party challenge, one candidate always gets a majority. In fact, there have been only two elections in which no candidate received a majority, the election of 1800 and the election of 1824. Both these elections were contentious. I wrote about the election of 1800 some time ago, so now I will take on the story of the election of 1824. That election was, if possible, even more contentious than the former, although there was no duel in the aftermath. This is remarkable, considering that one of the candidates was Andrew Jackson, a man who apparently enjoyed dueling. By 1816 the first two-party system in the US had ended. The Federalist had slowly faded away after the election of 1800, and by 1820 President James Monroe had run unopposed for re-election. This period, the only time America has had a one-party political system, was known as the “Era of Good Feelings“. Domestic politics have never been quieter. It couldn’t last, of course. By 1824, there were already tensions forming in the ruling Democratic-Republican Party. A lot of this tension was regional. Different sections of the country, north and south, east and west, had different interests and favored different types of men for the presidency. Another problem was the method the party selected its candidate. Up until then, each party had held a caucus of the Congressmen in the party to select their candidates. It seemed undemocratic that a few politicians in Washington should select the man who would likely be the next President. Many people loudly denounced “King Caucus” , and instead preferred candidates selected by state legislatures or conventions. In 1824, the Congressional Caucus Selected, among many candidates, William Crawford of Georgia as the Democratic-Republican candidate. He had served as Secretary of the Treasury under President Monroe, and was Monroe’s favored choice as his successor. There were three other candidates, though. There was John Quincy Adams from Massachusetts. He was the son of President John Adams, and had served as M0nroe’s Secretary of State. At the time, the the position of Secretary of State was seen as the natural stepping stone to the Presidency, and Adams believed himself to be the natural heir. He was a talented man and had served his country with distinction. Several state legislatures in New England nominated him as the Democratic-Republican candidate. He was not so popular in the West and South as others. 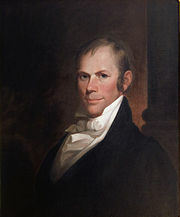 Henry Clay was another obvious and popular candidate. From Kentucky, he was a noted lawyer and orator, who was Speaker of the House of Representatives. He transformed the Speakership from a relatively minor position to one nearly equal to the President in power. He played a key role in crafting the Missouri Compromise of 1820. He was naturally popular in the South and West. Finally, there was Andrew Jackson. He was from Tennessee, and was a hero of the War of 1812, the Creek war, and the Seminole War. He was noted for his victory at the Battle of New Orleans, even though the battle took place after the War of 1812 was actually over. Although Jackson was a wealthy landowner, he favored a more democratic political system. He was also popular in the South and West. There was also John C. Calhoun from South Carolina. He had served as Secretary of War under Monroe and wanted to run for President but lacked support. He was popular, though and settled for running for Vice President with the support of Jackson and Adams. With four candidates, all from the same party, and generally favoring the same policies, the Presidential contest became a matter of personalities and regionalism. It was considered undignified for presidential candidates to actively campaign but their supporters eagerly campaigned on their behalf and the campaign of 1824 quickly became enthusiastic, personal and negative, with each candidate’s advocates praising their man and condemning the others. Adams had an English wife. Clay was a drunk and Crawford a thief. Jackson was a wild man who liked to kill people. With four candidates, no one achieved a majority of electoral votes. Adams won the New England states and got 108, 740 popular votes with 84 electoral votes. Jackson was ahead of him, gaining most of the south, Indiana, Pennsylvania, and New Jersey, with 153,544 popular votes and 99 electoral votes. William Crawford was third with Virginia and Georgia and 40,856 popular votes and 41 electoral votes. Henry Clay was last. He got 47,531 popular votes and won Kentucky, Ohio, and Missouri with 37 electoral votes. New York, Delaware, Maryland, Louisiana, and Illinois split their votes. Since no candidate won a majority of the Electoral College, the decision went to Congress, as stated under the terms of the Twelfth Amendment. This meant that the House of Representatives would select the President from the top three candidates; Jackson, Adams, and Crawford, with each state delegation getting one vote, while the Senate would select the Vice President. 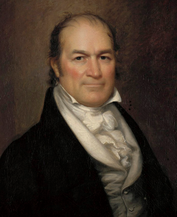 Calhoun had easily won the Electoral Vote for Vice President, so that was settled. Clay, in fourth place, was out of the running for President, but he had considerable influence in the House and would inevitably play an important role in the selection of the next President. He eventually threw his support to Adams and in the end Adams won thirteen states, Jackson nine, and Crawford four. Andrew Jackson was not very happy with the results. He had gotten the most votes, both popular and electoral, and it seemed to him, quite reasonably, that he should have been selected. His suspicions that there had been some sort of deal between Adams and Clay seemed to be confirmed when Adams named Clay as his Secretary of State, and he loudly denounced the “corrupt bargain”. Adams was aware that his election, being so irregular, lacked a certain legitimacy, and he regretted that they could not simply hold the election over again. Was there a corrupt bargain? It seems incredible that there wasn’t some sort of negotiations between Clay and Adams. Yet, Clay had made no secret that he vastly preferred Adams to Jackson, who he viewed with disdain. Clay was also a natural choice for Secretary of State and perhaps any President would have been happy to name him for any cabinet position. It didn’t matter, though. The deal was seen as corrupt, especially by Jackson’s supporters. 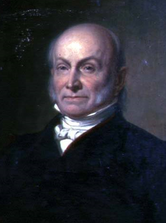 John Quincy Adams turned out to be a decent man and President. He wasn’t able to get much done, largely because of the way in which he became President, but also because he was not a natural politician and, like his father, disdained to play the usual political party games. He was easily defeated by Andrew Jackson in 1828 and later went on to have a distinguished career in Congress. 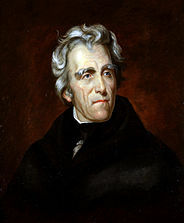 Andrew Jackson was one of the most noteworthy Presidents in American history, and served from 1829-1837. Henry Clay ran for President again in 1836 and Jackson won by a landslide. He continued to oppose Jackson and founded the Whig Party. This entry was posted on October 30, 2012 at 7:35 pm and is filed under History, Politics, Presidential Elections. You can follow any responses to this entry through the RSS 2.0 feed. You can leave a response, or trackback from your own site.